In Defense of Dolphins: The New Moral Frontier | Website of Thomas I. White, Ph.D. In Defense of Dolphins: The New Moral Frontier is a groundbreaking book in which philosopher Thomas White argues that the scientific evidence is now strong enough to support the claim that dolphins are, like humans, self-aware, intelligent beings with emotions, personalities and the capacity to control their actions. 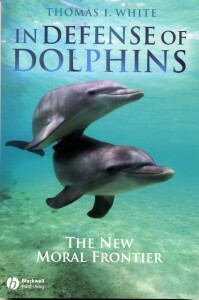 Accordingly, White argues, dolphins should be regarded as “nonhuman persons” and valued as individuals. White also concludes that, from an ethical perspective, the injury, deaths and captivity of dolphins at the hands of humans are wrong.